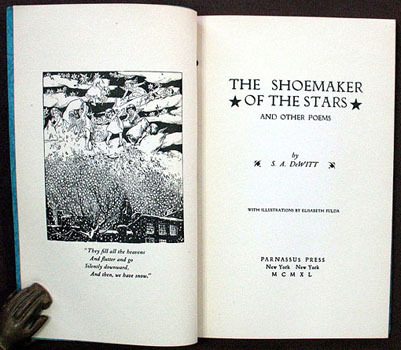 The Shoemaker of the Stars & Other Poems. New York: Parnassus Press, (1951). ￥3,000 (税込み) 24.8 x 16.3 cm. 48 pp., with three full-page and cover illustrations by Elisabeth Fulda. Suede covers and pictorial paste-on, in broken folder. Signed by the author.